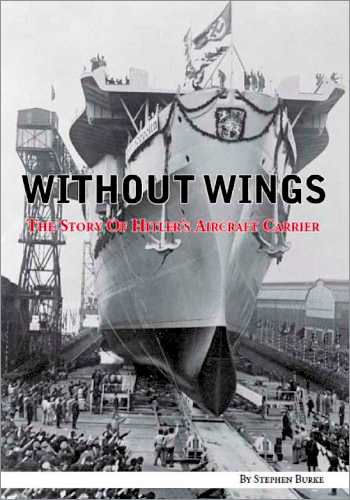 Planned as one of four carriers, the premature start to the war ensured that the others never materialized, leaving the Graf Zeppelin as Germany's sole aircraft carrier. But a combination of steel and manpower shortages conspired to have the necessary work needed to complete her suspended. Launched in 1938, and measuring over a quarter of a kilometre in length, the aircraft carrier Graf Zeppelin was the largest ship ever built by Nazi Germany. She was to operate the most modern carrier aircraft in the western world, and as such was feared by Great Britain's Royal Navy. Planned as one of four carriers, the premature start to World War II ensured that the others never materialised, leaving the Graf Zeppelin as Germany's sole aircraft carrier. Afloat and 85 per cent complete as the war began, a combination of steel and manpower shortages, conspired to have the necessary work needed to complete her suspended. Moved to the waters of occupied Poland as protection from Allied bomber attacks, she languished there for a number of years before the strategic importance of such a ship was recognised and work on her once again began under direct orders from Adolf Hitler. Considered a greater threat to British sea power than Germany's massive twin battleships Bismarck and Tirpitz, many in the Royal Navy had concerns that Britain's powerful but largely aging surface fleet was ill prepared to cope with the German carrier. Surviving an attack by the RAF, she would eventually meet her end after receiving multiple bomb and torpedo hits in an orchestrated attack by Soviet ships and aircraft. Once on the seabed, she lay largely forgotten in post war Europe until the discovery of her wreck in June 2006, lying deep in the Baltic Sea. Drawing on previously unpublished documentation taken from numerous eyewitness accounts, this narrative tracks the incredible tale of Germany's sole aircraft carrier. A leviathan that could have altered the outcome of World War II, perhaps even making Germany the victor long before America had entered into the war.